"Survival in the epicurean jungle was a matter of brawn and culinary skill, in which mastery of the Switchblade Spork was king. 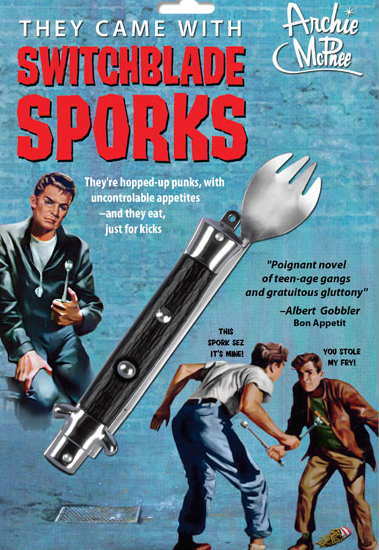 Gangs of sous-chefs and line cooks ruled the streets and no food was safe from the steely glint of their sporks." Want kids to eat more veggies? Research written up in The Journal of the American Medicine Association (JAMA) says that putting pictures on cafeteria trays helps. Score one for the power of suggestion. States, like Massachusetts, are increasingly looking to create brands of provenence to market fisheries. “If we took a look at fish being landed in Massachusetts and put a mark on them ... it allows a story and to tie in what’s happening in New Bedford or Gloucester. It means something to [diners]." A new photo and text project assembles a Lexicon of Sustainability, from Backyard Pollinator to Kitchen Incubator. Pesticides are bad to eat, but they're even worse to live around. Grist looks at the environmental and social costs of conventional agriculture, from chemicals that dust fruit like snow to contaminated drinking water. Ancient ice, hopefully not headed for a cocktail near you. In Chile, police are holding a man found trying to smuggle five tons of a Patagonian glacier for upscale bar drinks.